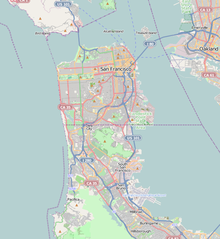 San Francisco International Airport (IATA: SFO, ICAO: KSFO, FAA LID: SFO) is the airport which serves San Francisco. It is locatit 13 miles (21 km) sooth o dountoun San Francisco, Californie, near Millbrae an San Bruno in unincorporatit San Mateo County. ↑ "SFO – San Francisco International Airport". San Francisco International Airport. Retrieved August 3, 2009. ↑ "San Francisco International Airport". Geographic Names Information System. Unitit States Geological Survey. Retrieved May 3, 2009. This page wis last eeditit on 4 Mairch 2018, at 01:50.